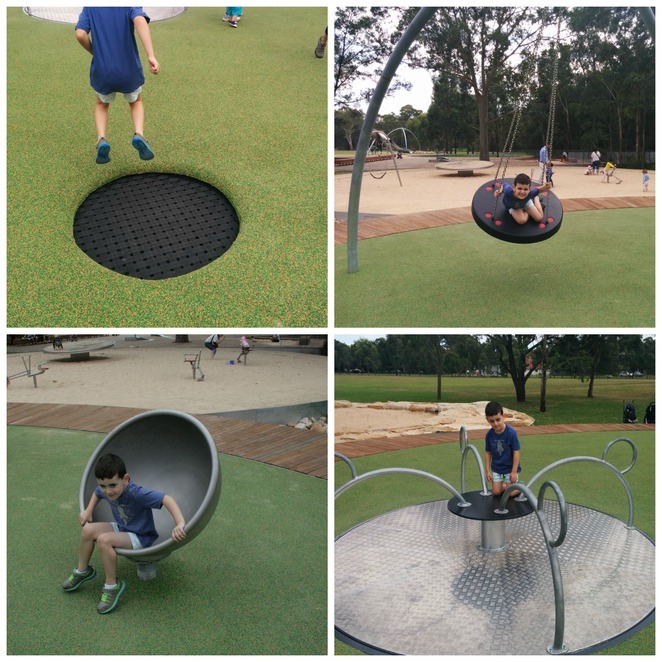 Parramatta Park was already home to two excellent playgrounds but they now pale into insignificance since the creation of the Domain Creek Playground. This beautifully designed playground seamlessly blends into the natural surrounds of Parramatta Park and children of all ages will want to spend hours exploring every nook and cranny of this awesome play space. All of the equipment in the spacious playground is connected by a series of walkways. Along the way little sculptures of Australian reptiles sit life like which adds to the bush like feel of the whole playground. When we arrived we first road tested the very cool slippery slide. Kids have to climb up a rope ladder to the top of the slide where they are almost cocooned in a wooden pod type of structure and from there they slide down the tubular slippery slide onto a nice spongy surface. Next stop was the horizontal climbing frame. This frame is probably half a meter off the ground and once kids gain their balance they will be walking, climbing and shuffling across it like a crab, whilst their carers sit back and watch on one of the wooden box seats provided. Throughout the whole playground there are different possies where adults can sit back and look on as their kids have just a bit too much fun. From here we headed to one of the several sandpits that are in the playground. The smallest pit is the final destination for the water course that has been built into the board-walk. At the top of the water course are two hand pumps where kids can test out their upper body strength to see who can create the biggest water flow. The largest sandpit has three sand diggers in it where kids will no doubt fight over who gets to use the controls as well as a swing and whirly gig, with the sand providing a soft landing in case anyone comes a cropper! I think our favourite piece of equipment in the whole playground was the mini trampolines that have been built into the spongy soft ground. Children and adults alike will have lots of fun seeing how high they can jump up and down. Also in this space are pieces of equipment that kids can spin around and around on and a couple of big round swings that can test their vertical limits. If you have kids that prefer their feet firmly on the ground they can create some music on the bush xylophone or see how good their coordination is by wandering around the circular design in the green grass area. When we thought we had discovered every nook and cranny of the Domain Creek Playground we spied in the scrub a hidden cubby! This is in between all of the playground areas and is camouflaged by branches and leaves - underneath all of that is a purpose built metal structure inside which I'm sure little people will love hiding from their parents and perhaps discovering a little critter or two! Parking: There is a lot of parking within walking distance of the playground but during the weekends this is highly sought after, so it may be wise to arrive early. Access: The playground is both pram and wheelchair friendly but you do have to walk a little distance over grass to get there. Toilets: They are only a couple of minutes walk away near the Queens Roads entrance. Coffee: The closest coffee can be found at the Parramatta Park Cafe. Shade: I suggest that you slip slop slap the whole family as the playground isn't shaded. I looks like a brilliant playground, playgrounds, such as the horizontal climbing ropes, and the xylophone. Just took my kids (ages 4 and 6) there today and they absolutely loved it. The playground construction, safety considerations and spacing between the play equipments appears to have been very well designed and really thorough compared to many other playgrounds we've been to. Would definitely come again. The only downside is the 2 hour parking restriction which doesn't seem to be family friendly. It's school holidays too and we saw a parking ranger taking photos of cars/plates and issuing parking tickets. Looks fantastic Little Munch. Can't wait to check it out. This park is fantastic - and it's not even finished! We spied a flying fox in the making today. The sound box in the area near the cave was a favourite of ours too. And the musical 'bells' in the boardwalk. Great spot!